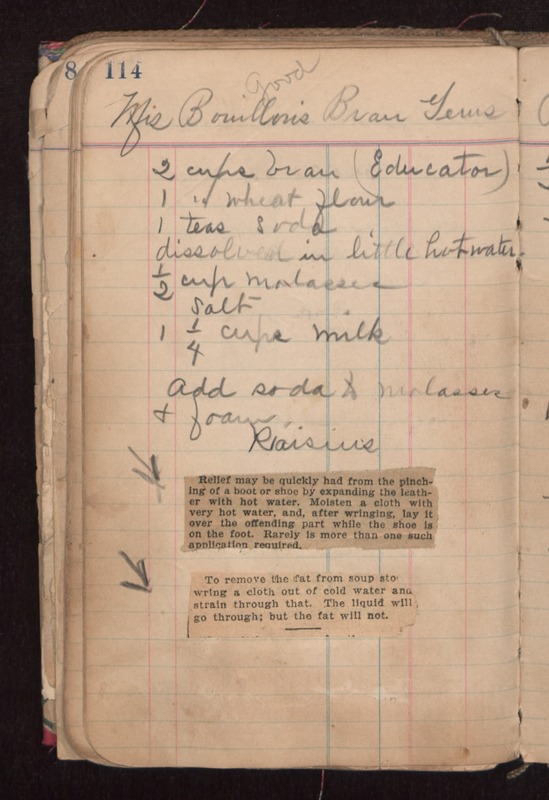 Mrs Bouillon's Bran Gems good 2 cups bran (Educator) 1" wheat flour 1 teas Soda dissolved in little hot water 1/2 cups molasses Salt 1 1/4 cups milk Add soda to molasses & foam Raisins Relief may be quickly had from the pinching of a boot or shoe by expanding the leather with hot water. Moisten a cloth with very hot water, and, after wringing, lay it over the offending part while the shoe is on the foot. Rarely is more than one such application required. To remove the fat from soup stock, wring a cloth out of cold water and strain through that. The liquid will go through; but the fat will not.